a secondary combustion chamber in certain turbojet engines that is used to augment the engine thrust for a short time (see). An engine equipped with an afterburner is called an afterburning engine. An afterburner is situated between the turbine and the jet nozzle of a turbojet engine or a dual-cycle engine. The gas that leaves the turbine still contains much oxygen; in a turbojet engine, this gas alone enters the diffuser of the afterburner. In a dual-cycle engine, a mixture of the gas that leaves the turbine and air from a bypass duct enters the diffuser. The speed of the gas flow is reduced in the diffuser, and fuel—usually aviation kerosene—is then injected into the flow. When the fuel is burned in the afterburner, the temperature rises and the exhaust jet velocity increases. Flameholders are used so that the combustion process occurs over the shortest possible distance. A liner is employed to shield the walls of the afterburner. 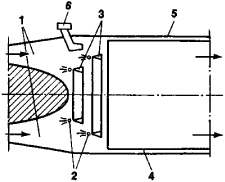 The afterburner is started by a flame from a precombustion chamber (see Figure 1). Afterburners may also be used to boost the power of free-piston engines. The exhaust ejector nozzle, downstream of the J58 afterburner exit, has sets of free-floating blow-in doors and trailing-edge flaps, all adjusted during flight by internal and external pressure forces, to maximize thrust. If they miss their old captain they can pop over for and reminisce over the only Afterburner left in Perry Barr. These shortcomings, however, do not prevent Afterburner from being required reading for Airmen and air leaders. He noted that the afterburner cut out and observed smoke in the vicinity of the engine. If a superior force of Soviet aircraft arrives, the pilot exercises discretion and bolts, using sustained supersonic speed to outrun pursuers who can go into afterburner only momentarily. The afterburner tests were conducted in an advanced testing facility at GE. When I hit the top speed I turn on the afterburner," he sings on the track. Being too cold to really enjoy the amazing Afterburner stage on Sunday night. The integral afterburner controls the smoke and fumes so that the process is environmentally friendly. A Adding oxygen to your hot or cold blast cupolas can provide many benefits, including increased production rates, reduced coke usage, alloy solids injection into the melt zone, coke replacement with natural gas and reduced afterburner loads. Q Would it help to add oxygen to my cupola? If so, how should it be added? John Geinda snapped up the Seventh Trap after hearing about the return of speedway and he hopes his extra hot Brummie Afterburner curry will be a hit with fans and riders alike.